When your furry friend chomps into one of these nutritious, delicious treats, bad breath doesn’t stand a chance! 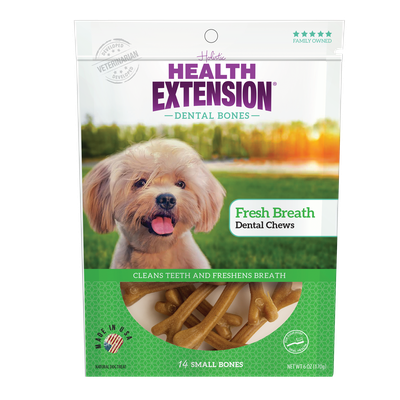 Our Fresh Breath Dental Bones are formulated with kelp and parsley to naturally freshen breath, while their special texture helps scrub plaque away with every bite. Plus, these super-tasty bones are packed with antioxidants, vitamins, minerals and essential amino acids like all Health Extension pet foods and treats. With natural kelp and parsley!